As Biloxi was a popular summer resort before the coming of the railroad in 1871 [sic] there was always plenty of rental cottages available by the season in addition to private boarding houses and hotels. A regular 'ferry' service was provided between the Mississippi Coast 'watering places' and New Orleans by paddle-wheel steamers. The Nixon Hotel was on the corner of Nixon Street and beach Road but it was torn down for the construction of the Harry T. Howard mansion. The Beach Hotel was just west of Main Street and was operated by the Drysdales: Misses Jennie, Annie, and Jo. They had three brothers: Harry, John, and Bob. On the northeast corner of Lameuse Street and Beach Road was the Shady Grove, a hotel owned and operated by Mr. Lameuse. It later became the popular Montross Hotel, the social gathering place for Biloxians. It later became the Riviera Hotel. In 1891 the Cress Villa was built on Beach Road west of Lameuse. It was owned and operated by Captain and Mrs. Ernest Desporte, Sr. Next was the Bayview Hotel, owned and operated by Mr. and Mrs. Sullivan. It occupied the northeast corner of beach Road and Delauney Street. On the northwest corner of was the Arcade Hotel, owned and operated by Mr. and Mrs. Pat Kennedy. It was described as being a 'mesque' building. Next to it was the Terre Cota [sic], formerly an Exposition Building at the New Orleans Worlds Fair. Mr. Kennedy purchased the building, had it dismantledand brought to Biloxi in sections, and had it reassembled on Biloxi beach. It is said to be the first pre-fabricated building in the United States. The Magnolia Hotel was built in 1847 by the Hahn Family and reputed to be the oldest hotel on the Coast. The property remained in the Hahn-Holley family over the years until Camille  and the dateful coming of Urban renewal. Through the efforts of Glen Swetman and other public-spirited citizens the old Magnolia Hotel, which was wrecked by the Hurricane of 1969, was moved to the new site on Water Street. It was reconstructed as a public building of much historical value. It did me good to note the recognition of the old Magnolia Hotel as an historical item for tourist attraction. Built in 1847 it recalled to memory the many times I danced and banquets I attended in its spacious dining room. I remember very well-Messrs. Henry [Hahn], Herman [Hahn], and Louis Hahn and their sister Mrs. Holley who operated the hotel until her passing. Messrs. Henry Hahn and Herman Hahn were ardent fishermen and thought nothing of rowing their skiff from the Magnolia wharf to the L&N [railroad] Bridge to fish for sheepshead. Louis Hahn was captain of the steamboat Loxley for Ralph Seeberg & Company as long as they were in business in Biloxi. Captain Louis Hahn was also an ardent sports fisherman his favorite was fishing for redfish in Big Lake. After Ralph Seeberg moved to Gulfport, Captain Louis Hahn opened a shoe store at the northwest corner of West Howard and Magnolia Street. Mrs. Holley, the hotel manager, was a widow, and the mother of Anson Holley, Louis Holley, John Holley, Geneva Holley, Sarah Holley, and Florence Holley. I am also reminded of ‘Our Gang’-the ‘Magnolia Street Gang’, which consisted of Anson Holley, Louis Hahn, John 'Dock' Holley, Barrow Cousins, Reuben Cousins, Theodore Desporte, Ernest Desporte, John Meunier, Vickey Meunier, and Eugene P. Wilkes. In the afternoons and evenings, especially in summer, we would assemble on the benches on the south side of the road in front of the Magnolia Hotel. If any kid wanted a fight, a foot race or to race play [model] boats, he was accommodated. There was always boxing matches and usually fights, especially when the Volunteer Fireman’s parade passed along the beach. Our favorite sports bicycle racing and chasing so called 'Gown men', also sandbagging anyone who passed under the poer while floundering-we even sandbagged each other! The Gulf View Hotel was on the northeast corner of Seal Avenue and beach Road and the name was changed to Memphis Hotel and much later the Palmer House. It was on the locale of the famous water cure of Dr. Bahrenheidt [sic]. Before Seal Avenue was cut through to Howard Avenue [formerly Pass Christian Street] this property was a considerable piece of intact land. The only park in Biloxi existed here, starting about 200 feet, from the Beach to Howard Avenue. In this Seal park there was a horse racing, baseball and football games on a regula schedule. George Ahern, a young Biloxi boy, rode his first horse at ther park and later went on to become a famous jockey in racing circles. Along West Beach there were no other hotels at the time but in 1892 the property about a quarter mile west of the Biloxi Lighthouse was purchased for the construction of a privately owned college. In 1893, the Sea Coast Academy began operations under the ownership and tutelage of Dr. Rodebuch [sic] and son. This academy ceased as a college and was bought by Dr. H.M. Folkes and Dr. Talbert [sic]. Dr. Folkes came to the coast with the Public health Service to work at the Quarantine Station offshore. They converted the school into the Biloxi Sanatorium, a private hospital. The old wood frame buildings were later torn down and the modern brick, Colonial style, New Biloxi Hotel was erected on tis site. It operated for many years as one of Biloxi's leading hotels. This building too felt the hand of progress and was razed to its steel framework and converted into the Chateau Le Grand condominiums. A young attorney, Walter A. White, arrived in Biloxi in a covered wagon which he first parked on back bay. After he became acquainted with Biloxians he liked Biloxi so well that he returned to his home town and got his entire family and brought them back to live here. He opened a law office and began a very successful legal practice Lawyer White purchased some property a short distance from the Biloxi Cemetery and Mrs. White soon was operating the White House Hotel. A short distance further west was a large tract of land running from the Beach to Back Bay. It was owned by the Methodist Conference of Louisiana, Mississippi and Alabama. That section of the property from the Beach to the L&N Railroad was fenced in and became known as the Sea Shore Campground. A large number of cottages were built by members of the Methodist faith and occupied by their families during the summer months. A large Tabernacle was built and regular camp meetings continued all summer. North of this property and fronting on back Bay was another large tract of land owned by the U.S. Government and held in reserve for the vast number of oak trees, then desirable for lumber for ship construction. This tract was deeded over to the City of Biloxi for park and cemetery purposes and became known as the Naval Reserve Park. At one time in the twenties, the U.S. Coast Guard occupied a section of the park on Back Bay from which their cutter chased down rum runners. The property also had the Biloxi Airport and a Major League baseball park. The ball park was the training site for the Toledo Mudhens, Washington Senators, and Philadelphia Phillies. All of this property along with the Biloxi Country Club golf course was given to the Federal Government on which to locate Keesler Field. This 'gift' of Biloxi to the Federal Government also included parcels of land containing home sites which the city had to purchase before it could 'give' this land for Keesler Field. Just east of the Keesler property and fronting on back Bay was the Subdivision of Oak Park. Before it became Oak Park, it was a virgin wilderness on the Bay owned by Mr. and Mrs. Parkhurst. They operated a pecan and fig orchard thereon. This fine old couple befriended a man and gave him employment. This drifter, named Gibson, was later accused of murdering the Parkhurts and setting afire tier home. He was arrested, tried, convicted and hung. This entire case was bizarre and some felt that perhaps justice was not served. *from the Walter Fountain Collection in the Biloxi Public Library. Peter Flanagan died at Biloxi in 1846. Commencing on the south shore of the south Bay or shore of Biloxi measuring forty-eight feet on the Gulf of Mexico, running north along a road or street between the said Flanagan and the property of John Nixon. Three hundred feet to a line between the property of the Estate of Morse, thence forty-eight feet to a line between Benjamin Holley and said Flanagan, thence south to the Bay or Gulf of Mexico conveying there with all the water rights to said front. As rent for the above described premises for the said two years, Edward Milford agrees to take the frame of a house already erected on the said lot of land and the lumber attached thereto not already used, and complete it in a plain? workman like manner as an hotel or house of public resort on condition that the outlay he shall be called upon to make shall not exceed three hundred dollars and that he will pay the said Flanagan one hundred and fifty dollars as follows: pay fifty dollars in October 1843, and one hundred dollars on or before first of July Eighteen Hundred and forty-four. The State tax on real estate for the premises is to be paid by Edward Milford for the above two years. The said Edward Milford is to pay one-half of the insurance from fire on the said house, so soon as it is insured as the business which said Milford will establish in these premises is likely to prove advantageous to the property hereby leased, and which the said Flanagan reserves for the support of his children [yet minors]. He also agrees at the expiration of the present demurred lease to give the said Edward Milford, his heirs or assigns, the refusal of a new lease for six years or more at the annual rent of three hundred dollars per annum provided that whatever improvements the said Milford, his heirs or assigns may place upon the said ground are left there at the expiration of the said renewal term of lease for the benefit of the said Flanagan, his heirs or assigns. The Daily Picayune, “American Hotel”, June 9, 1843. The Daily Picayune, Batchelor’s Hall, Biloxi, Mississippi”, July 2, 1845. The Daily Picayune, “Batchelor’s Hall, Biloxi”, May 28, 1853. The Daily Picayune, “To rent at Biloxi, Mississippi”, May 27, 1856. Harrison County, Mississippi Chancery Court Cause 28, 'The Estate of Peter Flanagan"-November 1846. It did me good to note the recognition of the old Magnolia Hotel as an historical item for tourist attraction. Built in 1847 it recalled to memory the many times I danced and banquets I attended in its spacious dining room. I remember very well-Messrs. Henry [Hahn], Herman [Hahn], and Louis Hahn and their sister Mrs. Holley who operated the hotel until her passing. Messrs. Henry Hahn and Herman Hahn were ardent fishermen and thought nothing of rowing their skiff from the Magnolia wharf to the L&N [railroad] Bridge to fish for sheepshead. Louis Hahn was captain of the steamboat Loxley for Ralph Seeberg & Company as long as they were in business in Biloxi. Captain Louis Hahn was also an ardent sports fisherman his favorite was fishing for redfish in Big Lake. After Ralph Seeberg moved to Gulfport, Captain Louis Hahn opened a shoe store at the northwest corner of West Howard and Magnolia Street. Mrs. Holley, the hotel manager, was a widow, and the mother of Anson Holley, Louis Holley, John Holley, Geneva Holley, Sarah Holley, and Florence Holley. I am also reminded of ‘Our Gang’-the ‘Magnolia Street Gang’. In the afternoons and evenings, especially in summer, we would assemble on the benches on the south side of the road in front of the Magnolia Hotel. If any kid wanted a fight, a foot race or to race play [model] boats, he was accommodated. There was always boxing matches and usually fights, especially when the Volunteer Fireman’s parade passed along the beach. Our favorite sports bicycle racing and chasing so called 'Gown men', also sandbagging anyone who passed under the poer while floundering-we even sandbagged each other! The Daily Herald, "Know your Coast-Magnolia Hotel", July 7, 1956. The Daily Herald, "Oldest regional hotel still survives on Coast", [no date]. Location: East Beach, Biloxi, Mississippi between Main Street and of Bellman Street. John W. Nixon (1787-1849) was an early immigrant to New Orleans coming from Fermanah, Ulster Province, Northern Ireland. He made his livelihood as an attorney in the Crescent City. Circa 1814 at New Orleans, John W. Nixon married Adeline Cecelia Copp (1798-1878), a native of Dover, New Hampshire and the daughter of New Orleans lawyer, David Copp, Jr., who was murdered 1803 in a New Orleans gambling house. Mrs. Nixon was born April 23, 1798 and came to the Crescent City in 1808. Adeline C. Nixon was assessed $70 on her 75 acres of land in Biloxi. The Biloxi Daily Herald, “Suit filed”, October 14, 1902. The Biloxi Daily Herald, “Necrology [Henry R. Nixon]”, July 12, 1904. The Biloxi Daily Herald, “Necrology [Mrs. Martha B. Warfield]”, November 27, 1908. The Daily Herald, “Biloxi lady [Rowena L.M. Nixon] presents sword of her father to historical body”, January 25, 1915. The Daily Herald, “John Slidell Nixon is dead”, September 11, 1915. The Daily Herald, “James Kirk Nixon”, December 18, 1916. The Daily Herald, “Miss Nixon [Rowena L.M. Nixon] is taken by death”, August 9, 1917. The Daily Herald, “Nixon place is sold at auction”, August 7, 1918. The Daily Picayune, “Biloxi House”, September 7, 1848. The Daily True Delta, “Biloxi Hotel to rent”, February 28, 1858. The Daily True Delta, “Live Oak Hotel”, June 22, 1859. The Louisiana Advertiser, “Commercial report”, July 6, 1820. The Pascagoula Democrat-Star, “Died [Adaline Copp Nixon]”, July 5, 1878. The Sunday Delta, “A New Biloxi Hotel”, June 7, 1857. The Sunday Delta, “Biloxi Hotel”, June 21, 1857. The Sunday Delta, “Biloxi Hotel Rent”, March 25, 1860. Located on the northeast corner of Lameuse Street and Beach Boulevard [also called Front Street] in the Jean-Baptite Carco Land Grant, and the S/2 of Section 28, T7S-R9W. Although he never owned the hostelry, it was named for Peter J. Montross (1841-1897), the proprietor for several decades in the late 19th Century. In May 1874, Chancellor W.G. Henderson of the Chancery Court of Harrison County, Mississippi opined and adjudicated in the partition suit of Chancery Court cause No. 143, Peter Liendhardt et al v. Sherrod Seaman et al. This litigation involved the partition of the ‘Lameuse Property’ also called the ‘Shady Grove Hotel’ at Biloxi. This tract was described in this law suit as“containing by estimation forty arpents of land [more or less] bounded and described as follows. Beginning at the Beach at the Pass of Biloxi, thence north to the Back Bay of Biloxi; thence southeast along the shore of said Bay so as to include one arpent; thence south to the said pass of Biloxi; thence to the place of beginning. Bounded south by the Pass of Biloxi or Gulf of Mexico; north by the Back Bay of Biloxi; west by Lameuse Street; east by Wetzell heirs having a few small lots sold off. The accessibility, pure air and freedom from malaria, render Biloxi one of the most desirable spots on the Gulf shore. Applications for rooms by mail or telegraph will receive prompt attention. Peter J. Montross (1841-1897) was born in Campeche, Mexico. At New Orleans, in October 1879, Mr. Montross married Alphonsine Lliambias (1850-1945), the daughter of Juan Lliambias (1815-1892), a native of Mannesa, Spain, and Louise Pamela Ranzeau (1820-1909). P.J. Montross came to Biloxi, Mississippi before 1880 and became engaged in the hotel business on Front Street [Beach Boulevard] and Lameuse Street. He operated the Montross House and Shady Grove, both hostelries, catering to tourists seeking fresh seafood, a temperate and salubrious climate, and the rest and relaxation offered by a quite seaside resort on the Mexican Gulf. Peter J. Montross expired at his Biloxi hotel on March 27, 1897. He was survived by his wife, and three sons, Paul Wallace Montross (1875-1927+), Albert Montross (1891-1917), and Peter J. Montross. Jr. (1883-1930) m. Amelia Bayhi. In 1896, Major J.H. Miller shot and killed Jules Soule, editor of The Biloxi Review. King Bienville with Blanche Picard (1887-1930+), as queen, of Biloxi’s initial Mardi Gras in March 1908. After the demise of Colonel Apperson in 1939, Lucille E. Apperson remained at her 127 Lameuse Street domicile, which was just north of the Riviera Hotel. She was born at Lincoln, Illinois on February 19, 1884, the daughter of Lincoln Evans and Nora Flynn. When John C. Hunt acquired the Riviera Hotel in July 1939, he had many business interests particularly a large furniture store at Dyersburg, Tennessee. On September 29, 1917, Billie Roberts married Hugh Virgil Sherrill (1876-1927), born April 18, 1876, at Madison County, Tennessee. He was the son of Dr. Hugh Newton Sherrill (1837-1903) who was born on August 7, 1837 and Mary E. Hardy (1846-1910+), both Tennessee natives. Dr. H.N. Sherrill married Miss Hardy in September 1865. Their other children were: Algernon S. Sherrill (1868-1920+); Clarence H. Sherrill (1873-1900+); and Joseph L. Sherrill (1879-1900+). This Sherrill family is rooted in North Carolina thorough Archibald Sherrill and Agnes Moss. By 1935, Billie R. Sherrill had relocated to East Beach at Gulfport, Mississippi. In the late summer and early fall of 1935, she went to Europe. She returned on the SS Ile de France leaving Le Havre, France for New York City in early October. In 1948, H. Virgil Sherrill resided at New Orleans. Here he may have met Elizabeth ‘Betty’ Stevens (b. 1924), a native of the Crescent City. Delicious home cooked meals prepared by Mrs. Jennie May White at popular prices. Also Sunday night buffet supper. Cool, comfortable rooms with ceiling fans, new innerspring mattresses in each room. Homelike atmosphere. UNDER COMPLETE NEW MANAGEMENT SINCE AUGUST 8th, 1941. Nap L. Cassibry II, Early Settlers and Land Grants at Biloxi, Volume I, (Mississippi Coast Historical and Genealogical Society: Biloxi, Mississippi-Special Issue 5, November 1986), p. 82. Nap L. Cassibry II, Early Settlers and Land Grants at Biloxi, Volume II, (Mississippi Coast Historical and Genealogical Society: Biloxi, Mississippi-Special Issue 5, November 1986). Nap L. Cassibry II, The Ladner Odyssey, Volume II, (Mississippi Coast Historical and Genealogical Society: Biloxi, Mississippi-Special Issue 5, November 1986). Charles L. Dyer, Along The Gulf, (Women of the Trinity Episcopal Church: Pass Christian-1971. Originally published 1895). T.H. Glenn, The Mexican Gulf Coast on Mobile Bay & Mississippi Sound Illustrated, (Delchamps: Mobile, Alabama-1893). The History of Jackson County, Mississippi, ‘William C. Seaman’ , (Jackson County, Mississippi Genealogical Society: Pascagoula, Mississippi- 1989). Southern Bell Telephone and Telegraph Co., “Telephone Directory-Gulfport, Miss.”, November 1941. Harrison County, Mississippi Chancery Court Cause No. 143, “Peter Lienhardt, et al v. Sherrod Seaman, et al-May 1874. Harrison County, Mississippi Chancery Court Cause No. 889, ‘The Estate of P.J. Montross’, 1897. Harrison County, Mississippi Chancery Court Cause No. 11071, ‘Riviera Hotel Company, C.B. Foster, and C.A. Delacruz v. Mrs. T.K. Devitt, et al”-May 1930. HarrisonCounty, Mississippi Chancery Court Cause No. 13635, ‘ E.C. Ellison, et al v. J.W. Apperson’, May 1934. The Biloxi Herald, ‘Montross Hotel advertisement’, January 14, 1888. The Biloxi Herald, “First Excursion of the Season”, February 18, 1888. The Biloxi Herald, ‘Montross Hotel advertisement’, February 18, 1888. The Biloxi Herald, “City News”, March 3, 1888. The Biloxi Herald, “Northern Visitors”, March 10, 1888. The Biloxi Herald, “City News”, April 7, 1888. The Biloxi Herald, “Proceedings Town Council”, August 18, 1888. The Biloxi Herald, “Visit to the Northwest”, October 6, 1888. The Biloxi Herald, “City News”, November 10, 1888. The Biloxi Herald, “City News”, November 24, 1888. The Biloxi Herald, “The Glorious Fourth”, July 4, 1891. The Biloxi Herald, “Local Happenings”, May 28, 1892. The Biloxi Herald, “Montross Hotel”, December 9, 1893. The Biloxi Herald, “Local Happenings”, January 20, 1894. The Biloxi Herald, “Latest City News”, June 13, 1896. The Biloxi Daily Herald, “Necrology-Major Peter J. Montross”, April 3, 1897, p. 8. The Biloxi Daily Herald, “Latest City News”, April 3, 1897. The Biloxi Daily Herald, “Latest City News”, April 10, 1897. The Biloxi Daily Herald, “Hotel Montross”, May 8, 1897. The Biloxi Daily Herald, “Latest City News”, July 3, 1897. The Biloxi Daily Herald, “Concert at the Montross”, July 17, 1897. The Biloxi Daily Herald, “Local and Personal”, January 17, 1899. The Biloxi Daily Herald, “Affeld-Sanders”, April 10, 1900. The Biloxi Daily Herald, “Pleasure boat for hire”, June 26, 1900. The Biloxi Daily Herald, “Pretty Things”, August 22, 1900. The Biloxi Daily Herald, “City News”, October 30, 1900. The Biloxi Daily Herald, “Swept by Flames”, November 9, 1900. The Biloxi Daily Herald, “City News”, November 18, 1900. The Biloxi Daily Herald, “City News”, January 5, 1901. The Biloxi Daily Herald, “City News”, January 8, 1901. The Biloxi Daily Herald, “City News”, January 10, 1901. The Biloxi Daily Herald, “City News”, January 11, 1901. The Biloxi Daily Herald, “Mr. Sawford honored”, January 29, 1902. The Biloxi Daily Herald, “City News”, February 25, 1902. The Biloxi Daily Herald, “Races for the soldiers”, August 13, 1902. The Biloxi Daily Herald, “Races Saturday”, August 19, 1902. The Biloxi Daily Herald, “Northern Visitors”, October 29, 1904. The Biloxi Daily Herald, “Among the Candidates”, July 29, 1907. The Biloxi Daily Herald, “Paid homage to honored dead [T.P. Dulion]”, February 23, 1907. The Daily Herald, “Carnvail (sic) next year to be bigger and better”, April 1908. The Daily Herald, “Mr. Sawford will retain Montross”, April 29, 1909. The Daily Herald, “Punches Biloxi Hotel Operator”, August 2, 1910. The Daily Herald, “Kimbrough home on beach is sold”, June 7, 1912. The Daily Herald, “Cadillac wins Grunewald Cup in race from Orleans to Biloxi, June 30, 1913. The Daily Herald, “Col. Apperson is Uncle of first Memphis hero”, May 14, 1918. The Daily Herald, “Biloxi News”, April 12, 1920. The Daily Herald, “Riviera work progressing”, September 23, 1922. The Daily Herald, “Riviera Hotel changes hands”, June 12, 1924. The Daily Herald, “Riviera improvements completed", August 6, 1926. The Daily Herald, “Florian Seal offers himself for reelection”, April 2, 1927. The Daily Herald, “Apperson leaves for Cuba”, April 8, 1927. The Daily Herald, “Popularizing Riviera cafe”, April 25, 1927. The Daily Herald, “Kiwanis meet at Riviera Hotel”, August 26, 1927. The Daily Herald, “Riviera improvements completed”, August 6, 1926. The Daily Herald, “Bilbo to be guest of Col. Apperson”, December 3, 1926. The Daily Herald, "Path leads Montross to return to Biloxi", May 3, 1927. The Daily Herald, "Col. Apperson buy Riviera for $80,000", November 4, 1929. The Daily Herald, "Riviera guests in new homes", November 5, 1929. The Daily Herald, “Riviera Hotel to open January 10”, December 31, 1929. The Daily Herald, “John Carraway dies”, August 6, 1931. The Daily Herald, “Carraway Funeral”, August 19, 1931. The Daily Herald, “Carraway Funeral”, August 21, 1931. The Daily Herald, “John Carraway buried”, August 24, 1931. The Daily Herald, “Mrs. Stanford Morse succumbs to illness”, November 10, 1932. The Daily Herald, “Remodeling pavilion”, November 21, 1936. The Daily Herald, “Mrs. Florian Seal dies”, September 12, 1936. The Daily Herald, “$10,000 left to Mrs. H.V. Sherill”, January 11, 1938. The Daily Herald, “Col. J.W. Apperson Taken By Death”, April 1, 1939. The Daily Herald, “New Management Riviera Hotel”, August 1, 1939. The Daily Herald, “N.H. Avery new Riviera manager”, , 1939. The Daily Herald, “I.S. Avery dies”, February 8, 1940. The Daily Herald, “Hotel manager is sued for $25,000”, February 20, 1941. The Daily Herald, “Riviera Hotel is sold to Mrs. Sherrill”, August 9, 1941. The Daily Herald, “Announce personnel of Riviera Hotel”, August 11, 1941. The Daily Herald, “Hotels have biggest season”, August 11, 1941. The Daily Herald, “Riviera Hotel [advertisement]”, August 14, 1941. The Daily Herald, “Attends Yale graduation”, June 3, 1942. The Daily Herald, “Once busy Biloxi Beach deep in sand”, September 24, 1947. The Daily Herald, “Lt. Sherrill cited”, November 29, 1946. The Daily Herald, “Morse-Sherrill”, November 15, 1948. The Daily Herald, “Mrs. J.W. Apperson Dies”, October 26, 1951. The Daily Herald, “Hotel redecorated”, September 29, 1954. The Daily Herald, “Riviera Hotel on Biloxi Beach is purchased for $100,000”, December 23, 1955. The Daily Herald, “Eugene Leonetti”, January 13, 1961. The Daily Herald, “Adrian Weill taken by death”, February 22, 1971. The Daily Herald, “Mrs. Stanford E. (Wilhelmina) Morse”, December 8, 1982. The Daily Picayune, "Yachting-Biloxi to have a fine building", August 21, 1900. The Jackson County Times, “Riviera Hotel is damaged by fire”, May 20, 1922. The Jackson County Times, “Local and Personal”, April 25, 1925. The Jackson County Times, “Col. Apperson Buys Riviera For $80,000”, November 9, 1929. The New Orleans Daily Picayune, “The Late Destructive Gale”, September 16, 1855. The Star of Pascagoula, “Our Watering Places”, June 26, 1875. The Sun Herald, “Jeanette Dees Weill”, April 21, 2002, p. A8. The Sun Herald, “FLASHBACK-A first-class hotel in Biloxi”, May 6, 2012, p. F10. Location: Block 126 ½. Lot west by Croesus, south by Water Street. 62 feet on Water Street , north 65 feet. Prior to the acquisition in March 1913, by August Tremmel (1873-1942), the parcel of land in Biloxi, Mississippi that would become the site of his tin shop and home was the location of a large hotel. The hotel was called the Boulo Hotel and it was probably erected by Charles DeJean (1812-1894), who was called “Boulo”. Charles DeJean was born at France and was the father of: Peter DeJean (1857-1909)who married Kate Williams in October 1880; Alice D. Lanius (1854-1904) m. Michael Smith Lanius (1848-1905); and Ida D. Fountain (18-1892). Peter was born in Louisiana his mother was from Louisiana. A hotel clerk in 1880. Jenny Bozonnier Tissot (1849-1912), a native of New Orleans and a member of the Bozonnier-Andry family from France, was the widow of Judge Aristeed L. Tissot of New Orleans. Judge Tissot adjudicated in the Civil District Court, formerly called the “old probate court”. The Tissot family maintained a summer home at Biloxi. It was situated on West Beach and Croesus Street. From a study of the Sanborn Maps of Biloxi, Mississippi, it can be determined with a high degree of certitude that The Boulo Hotel was demolished between 1904 and 1914. No further information. Adele Aldezer (1826-1916), first wife? Josephine DeJean (1844-1880), mother French. Charles M. Lanius (1881-1950) married Laura Tremmel (1884-1935), a sister of August Tremmel, who would acquire the DeJean hotel property later. In May 1899, Operating Sazerac Lunch House on the corner of Howard and Main Street. The Biloxi-D'Iberville Press, "The Way it Was"-'Biloxi's Chalet Boulo', November 18, 1995. The Biloxi Herald, “City News”, January 21, 1888. The Biloxi Herald, “Local Happenings”, June 6, 1891. The Biloxi Herald, “Sazarac Lunch House”, May 16, 1899. The Daily Herald, “Twenty years ago today”, December 19, 1914. The Pascagoula Democrat-Star, May 28, 1880. The Biloxi Herald, “City News”, February 25, 1888. The Biloxi Herald, "Advertisement", November 30, 1889. The Biloxi Herald, "Advertisement", December 21, 1889. The Biloxi Herald, "Advertisement", June 6, 1890. The Biloxi Herald, "The Arlington Hotel changes hands", July 26, 1890. The Biloxi Herald, "Fire Record", September 12, 1891. The Daily Herald, 'Bayview Hotel improvements', January 6, 1927, p. 2. In 1914, run by four Drysdale sisters. Jennie [Jane] Drysdale was the buyer and general manager; Lizzie Drysdale had married Charles L. Johnson, but after being widowed had returned to the family business; Jo Drysdale; Property known as Vacation Village in 1959. The Daily Herald, 'Know Your Coast'-Today Two Readers Take Over The Column', January 30, 1959. 2. The name Avelez was chosen for the Brady hotel. Lazarus Lopez (1850-1903), the father of Erena Lopez Brady, had been born at Aviles, Asturias Province, north western Spain in October 1850. He left Spain for Cuba in 1863 and arrived in Texas before becoming a denizen of Biloxi, Mississippi circa 1870. Lazaro Lopez expired in Rome, Italy on September 25, 1903 as the result of an acute inflammation of his kidneys and dysentery. Earlier he and Julia Dulion Lopez (1857-1918), his loving spouse, with four of their youngest children, Julius M. Lopez (1886-1958), Erena Lopez, Rowena Lopez (1895-1986), and Noreta Lopez (1896-1960), had departed Biloxi, Mississippi via the L&N Railroad for NYC where they boarded an ocean liner for Europe. In the summer of 1930, the Caldwell family was domiciled at Chicago. Phil and Rowena L. Caldwell took a two month European tour at this time. Their three children were enrolled in summer camps in Michigan. Jill and Margaret Caldwell went to Camp Meecasinio near Baldwin, Michigan while Jack attended Camp Algonquin near Alanson, Michigan. The Avelez Hotel structure was struck by a devastating conflagration in the early morning of August 24, 1930. The fire originated in the Hill Store in the arcade fronting the hotel section of the building. Guests of the Avelez Hotel were notified and evacuated from their rooms without harm. Initial damage estimates from insurance adjusters placed the total cost of the fire at about $65,000, which when itemized came to $40,000 to $50,000 for stocks and fixtures and about $25,000 for the structure. The hotel proper was harmed only by smoke and water. Mrs. Erena Brady Lopez announced that the fire damaged arcade would be rebuilt. The day after the fire, Collins Brothers and Manual and Wetzel, two local building contractors, were making estimates for Mrs. Brady and her insurance companies respectively. Businesses affected by the conflagration in addition to the Hill Store were: Eddie’s Drug Store-Eddie Ouille owner; La Nationale Beauty Parlor-Mrs. Charles H. Patterson of NOLA owner; The Biloxi Insurance Agency; the barber shop-N.H. McAllister, proprietor; and the Avelez Café operated by Dan Markotich. (The Daily Herald, August 25, 1930, p. 1). Harrison County, Mississippi Chancery Court Cause No. 16897, “R Finance Corporation v. John T. Powers, et al”, March 1940. The Biloxi-D’Iberville Press, “Picture of the Past-Avelez Hotel—In the Late Twenties”, July 24, 1985. The Biloxi-D’Iberville Press, “The History of the Biloxi area-Avelez Hotel”, March 23, 1994. The Daily Herald,“Caldwell-Lopez”, January 13, 1917. The Daily Herald,“Mr. Caldwell goes to Camp Shelby”, October 4, 1917. The Daily Herald,“Notice to the public”, October 8, 1917. The Daily Herald,“Lopez home to be demolished”, January 22, 1920. The Daily Herald,“Biloxi home is being torn down”, June 10, 1920. The Daily Herald, “Making home in Texas”, May 12, 1921. The Daily Herald, “Handsome hotel to open New Year’s Eve”, December 28, 1923. The Daily Herald, “Hotel Avelez opens today”, December 31, 1923. The Daily Herald, “Hundreds attend opening reception of Hotel Avelez”, January 1, 1924. The Daily Herald, “Biloxi Items”, April 23, 1930. The Daily Herald, “Caldwells abroad”, July 31, 1930. The Daily Herald, “To rebuild Avalez building after $60,000 conflagration”, August 25, 1930. The Daily Herald, “Biloxi News Paragraphs”, March30, 1937. The Daily Herald, “New Orleans bank buys Avelez Hotel”, May 14, 1940. The Daily Herald, “Local syndicate buys Avelez Hotel”, October 14, 1940. The Daily Herald, “Court authorizes sale Avelez Hotel”, October 29, 1940. The Daily Herald, “Lease by Earle Hotel chain”, December 17, 1946. The Daily Herald, “Biloxi, Avelez leased by chain”, December 18, 1946. The Daily Herald, “Phillip Caldwell dies in Chicago”, June 9, 1951. The Daily Herald, “Mrs. Katherine Powers”, September 17, 1957. The Daily Herald, “John W. Powers", January 28, 1970, p. 2. 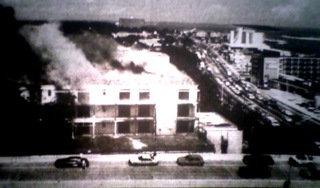 The Daily Herald, “Urban renewal threatens Biloxi's Avelez Hotel", September 14, 1970. The Daily Herald, “John T. Powers", September 19, 1971, p. A-2. The Ocean Springs News, “Mrs. Eva Mae Powers”, February 18, 1965. The Times-Picayune, “Sale of Avelez Hotel at Biloxi announced here”, January 12, 1937. The Times-Picayune, “Biloxi, Avelez leased by chain”, December 18, 1946. By December 1927, the New Biloxi Hotel was in the finishing phase of its construction. The furniture, fixtures, carpets and ancillary equipment had arrived. This is interesting the story on the Biloxi Hotel. The ‘old’ Biloxi Hotel, you wouldn’t know about, but this is a picture of it here. This was built in either 1903 or 1904 somewhere in there. It was after Laz Lopez’s death [September 25, 1903]. It was built as a sanatorium. The Daily Herald, “To open resort Hotel”, May 24, 1909. The Daily Herald, “To convert Hotel into Sanitarium”, September 7, 1909. The Daily Herald, “Biloxi News of Personal Interest”, January 14, 1910. The Daily Herald, “Will be known as Hotel Biloxi”, February 20, 1919. The Daily Herald, “Hotel Biloxi changes hands”, September 19, 1919. The Daily Herald, “Biloxi News Paragraphs”, October 31, 1922. The Daily Herald, “Bids soon for new hotel”, April 12, 1927. The Daily Herald, “Razing old Biloxi Hotel”, May 2, 1927. The Daily Herald, “Biloxi Hotel being moved”, May 5, 1927. The Daily Herald, “Another handsome new hotel for Biloxi”, May 7, 1927. The Daily Herald, “Contract is let for new $650,000 Biloxi Hotel”, May 11, 1927. The Daily Herald, “To complete Hotel Biloxi about Dec. 1”, October 11, 1927. The Daily Herald, “New Biloxi Hotel to open for business December 15”, December 1, 1927. The Daily Herald, “Hotel Biloxi [advertisement]”, April 3, 1948. The Daily Herald, “The Charter of Incorporation of Hotel Biloxi, Inc.”, November 9, 1949. The Daily Herald, “New Operation at Hotel Biloxi”, January 30, 1963. The Daily Herald, “Mrs. George Stannus”, April 21, 1966. The Sun Herald, “Biloxi Sanatorium put Coast on the map”, June 9?, 1995. Mrs. Joe W. (Dorothy Dorsett) Brown, whose horses won the Louisiana Derby and New Orleans Handicap six times each, died Saturday, October 14, 1989, of a heart attack at her home in New Orleans. She was 93 years of age and the widow of Joe W. Brown (1897-1959), wealthy oil and sportsman. Mrs. Brown was born March 31, 1896 at Texas City, Galveston County, Texas. Mrs. Brown was a prominent horse owner for more than 40 years. She took over the reins of the family stable when her husband died in 1959. The Browns won the Louisiana Derby with Rookwood in 1949, Matagorda in 1953 and Gigantic in 1954. She won it with Dapper Delegate in 1965, Kentucky Sherry in 1968 and El Baba in 1982. Green Hornet, Kentucky Sherry, List and El Baba carried the Brown family colors - white with black stars and a black "B" - in the Kentucky Derby. New Orleans Handicap winners from the Brown stable were Red Camilia in 1950, Tenacious in 1958-59, Green Hornet in 1964, Cabildo in 1967 and Listcapade in 1983. "Between her and her husband, they were some of the biggest sports people to hit New Orleans," said Fair Grounds General Manager Mervin Muniz. "Tenacious was probably the most popular horse to race at the Fair Grounds that I can remember. When you think of the Browns, they were the epitome of New Orleans racing and Louisiana racing." Tenacious is buried in the Fair Grounds infield. Mrs. Brown also was a philanthropist. The Joe W. Brown Recreation Center in eastern New Orleans, which was dedicated in 1976, benefited from a $250,000 donation from the Joe W. Brown and Dorothy B. Brown Foundation. The foundation also donated 163 acres of property worth an estimated $1 million for Joe W. Brown Memorial Park, named for her husband. Mrs. Brown owned the Broadwater Beach Hotel and Broadwater Beach Marina on the Mississippi Gulf Coast. She was former owner of the Horseshoe Club in Las Vegas, Neveda, the real estate that is now Lake Forest shopping center and the Valentine oil field in Lafourche Parish, Louisiana. Funeral services will be held at 1:15 p.m. Tuesday at Lake Lawn Metairie Funeral Home, 5100 Pontchartrain Blvd. Burial will be at Lake Lawn Park Mausoleum. Joe Worlick Brown (1897-1959) was born October 5, 1897 at Young County, Texas, which is about 70 miles NW of Fort Worth. Many thought that he was a native of Houston as he became a very successful oilman with his penchant for discovering new oil deposits. Joe W. Brown's crown jewel of his petroleum business was the Valentine Oil Field in LaFourche Parish, Louisiana where he began exploring for hydrocarbon bearing sands in 1945 on his Harang and Dousson leases. At the time of his demise, Brown's oil and gas reserves were valued at $75 million. At Las Vegas, Nevada, Joe W. Brown owned the Horseshoe Club, which he sold in July 1959. Here he displayed one million dollars in $10,000 bills. Insurance on the ostentatious display, a noted tourist attraction, cost $50,000 each year. Dorothy Dorsett Brown lived until February 15, 1989. She also died at New Orleans. Both their corporal remains were interred in the Lakelawn Park Cemetery at New Orleans. The Daily Herald [Biloxi], 'Sportsman Joe W. Brown is taken by death', February 16, 1959, p. 2. The Morning Advocate [Baton Rouge], '"Million Dollar" Joe brown dead', February 16,1959, p. 1. The Morning Advocate, (Baton Rouge, LA), 'Dorothy Brown: Prominent La. horse owner Brown dies', October 16, 1989, p. 7-C. The States Times Advocate [Baton Rouge], 'Rites set today for Joe Brown, wealthy oilman", February 16, 1959, p. 1. The Times-Picayune, '[Oil] Test slated near Covington', May 5, 1942, p. 37. The Times-Picayune, 'Charters', January 4, 1959, Sec. V, p. 16. The Times-Picayune, 'Rites arranged for sportsman', February 16, 1959, p. 1. The Times-Picayune, (New Orleans, LA), 'Mrs. Joe W. (Dorothy) Brown', October 16, 1989. The Daily Herald, "Peter F. Martin dies at home on West Beach today", July 25, 1951, p. 1. The Daily Herald, "Work started on swimming pool at Broadwater", June 21, 1952, p. 3. The Daily Herald, "Bank enters into gaming ban picture", February 19, 1954. The Daily Herald, "Luxury yacht at Broadwater', August 25, 1964, p. 21. The Daily Herald, "Liquor permit is approved for [Broadwater Beach] Hotel", July 22, 1966, p. 1. The Sun Herald, "Filmaker considers Broadwater purchase", May 1, 1987. The Sun Herald, "Colorful memories of the Broadwater", September 30, 2012, p. C5. Buena Vista Hotel [west wing] burns in 1966. Down South, 'Buena Vista opens new $1 million motel' , May-June 1958. The Daily Herald, 'New Orleans firm gets Biloxi Hotel contract', September 7, 1923. The Daily Herald, 'Guest houses open at Buena Vista Hotel', May 13, 1940. The Daily Herald, '[J.S. Love Jr.] new manager Buena Vista Hotel', September 3, 1941. The Daily Herald, 'Improvements for Buena Vista Deck', September 4, 1945. The Daily Herald, '$370,300 permit for Buena Vista Motel is issued', November 9, 1956. The Daily Herald, 'Hotel property sale scheduled', February 2, 1974. The Sun Herald, 'Last days of the Buena Vista', October 27, 1993. The Daily Herald, "Edgewater to open for winter Dec. 12; Renovating hotel", October 31, 1936, p. 6. The Daily Herald, "Edgewater, Markham Hotels $ 1 million Mississippi Coast industry",January 27, 1949. The Biloxi-D'Iberville Press, 'Time Traveler'-"The Edgewater Gulf Hotel", May 31, 2013, p.4 and June 6, 2013, p. 4. The Biloxi D'Iberville Press, 'Time Traveler'-"The White House", June 13 , 2013, p.4 and June 20, 2013, p. 4. The Daily Herald, '[John T.] White to manage Florida Hotel', November 23, 1939.The Daily Herald, 'Hotel property sale scheduled', February 2, 1974. The Sun Herald, 'White House Hotel gets a buyer', April 24, 2013, p. A1. Harold M. Olney died at Memorial Hospital in Gulfport, Mississippi on July 20, 1975. His corporal remains were sent to Clinton, Iowa for burial in the Rose Hill Cemetery. The Daily Herald, "Harold Maynard Olney", July 21, 1975.